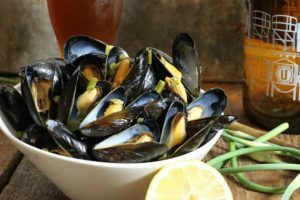 These beer steamed mussels tossed with garlic scapes and lemon make a great appetizer or meal, and are a guaranteed crowd pleaser. Enjoy them at home on the deck, gathered around a campfire, or cooked up right at the beach! 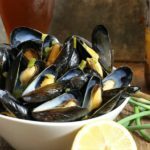 If your looking for a quick and easy shellfish recipe to cook at home, mussels are probably the way to go even for a beginner cook. Requiring very minimal prep work (just a little washing and checking for dead ones), mussels are easily flavored with your favorite herbs, spices, and sauces. A take on the traditional white wine and garlic mussels combo, I opted to make mine with beer and switch things up a little. A light local Belgian Ale specifically, (mostly because it’s what I had on hand), but the pairing actually worked extremely well. The easiest way to cook these beer steamed mussels is in a large pot with lid, but a deep walled pan will also work if cooking smaller batches. You want to ensure that the pot is large enough to hold all the mussels, even when cooked. Don’t forget the shells will open and the cooked mussels will almost double in volume. A 24 quart pot is large enough to cook 5lbs of mussels easily, and can double as a lobster pot as well! 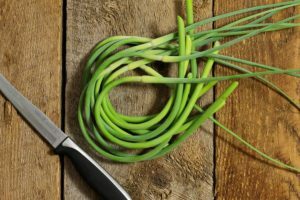 What Are Garlic Scapes & Where Do I Get Them? Garlic scapes are the immature flower stalk of the garlic plant, and can be found at farmers markets and grocery stores in mid June for a few weeks. The garlic scapes are a substitute for garlic cloves which are traditionally used when cooking mussels. Garlic scapes make a great substitute, and are delicious when steamed with the mussels. 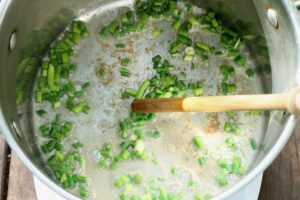 Tender, and similar in texture to green onion but with a light garlic flavor, they are an easy way to use up some home grown produce. 5lbs of Fresh Mussels (Don’t forget to wash the mussels right before cooking them! Melt a tablespoon or two of butter in your pot and then toss in a cup of freshly sliced garlic scapes. Saute the garlic scapes really quickly over high heat for 2 to 4 minutes to soften them up, giving them a stir or two to avoid scorching the scapes. This helps bring out some of their flavor, and who doesn’t love the smell of garlic cooking!? Next pour in the entire bottle of Belgian Ale, followed by 5 lbs of washed and cleaned mussels. Cover the pot with a lid and sit back. Let the pot come back to a boil, and then turn the heat down to a simmer. The mussels should steam for a good 5 -7 minutes before you check them. You can give the pot a shake (careful not to burn yourself), to coat all the mussels in hot liquid and ensure they cook evenly. This can also help larger more stubborn mussels cook a bit faster. Once 5 minutes are up open the lid and see how far the mussels are. 90% of the mussels should be open and cooked. Give the pot a stir or a shake to help the last few mussels finish cooking. Scoop out the beer steamed mussels with a slotted spoon or a strainer of some kind, and drizzle with the remaining butter. Sprinkle the chive flowers or fresh garlic scapes over the mussels and serve immediately! Can I Cook These Mussels At The Beach Or Over A Fire? Of course! Regardless of your cooking location, (over a campfire, on the stove, or on the BBQ) the above cooking method stays the same. If cooking the mussels over a fire, I would suggest using a cast iron pot or dutch oven, to prevent the bottom from scorching. Keep in mind cast iron gets really hot, so use oven mits or a thick dry cloth when moving the lid/ pot. 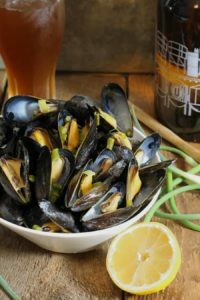 A super easy appetizer or meal, these beer steamed mussels tossed with garlic scapes and fresh lemon, are quick to make and bursting with flavor. 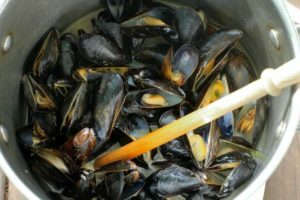 Wash the mussels in fresh water and check for any dead shellfish. Melt a tablespoon or two of butter in a large deep pot. Roughly chop the garlic scapes into bite size pieces. Toss the cup of freshly sliced garlic scapes into the butter. Saute the garlic scapes really quickly over high heat for 2 to 4 minutes to soften them up. Pour the entire bottle of Belgian Ale into the pot and bring it back to a boil. Add the 5 lbs of washed and cleaned mussels. Cover the pot with a lid and let the pot come back to a boil. Turn the heat down to a simmer. Let the mussels should steam for a good 5 -7 minutes . Once 5 -7 minutes are up open the lid and see how far the mussels are. 90% of the mussels should be open and cooked. Give the pot a stir or a shake to help the last few mussels finish cooking. Scoop out the beer steamed mussels with a slotted spoon or a strainer and drizzle with the remaining butter. Sprinkle the chive flowers or fresh garlic scapes over the mussels and serve immediately! Don't forget to wash the mussels right before cooking them! Love that you included garlic scapes – such a farmer’s market treasure. They are! I turned 2 lbs into a garlic scape powder…it’s surprisingly sweet! Love having access to unique produce like garlic scapes! We love mussels and I don’t know why I don’t cook them more often! You’ve inspired me to make this recipe more often! Love the simple ingredients you’ve used. Pinned! Thanks Elaine! Take a picture and tag me the next time you cook a batch! I’d love to see them! Now I’m craving mussels. I’ve always used wine, but I bet they would be just as delicious with beer! I LOVE garlic scapes!! What a delicious way to use them and such a simple recipe! 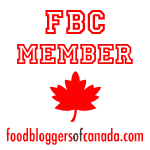 So much yum – can’t wait to try! This looks like a quick and awesome idea for a get together appetizer! Ok, never cooked mussels before but I this looks seriously delicious and I totally want to try! YUM!